I miss baseball so much I taught a bunch of kids who had no prior knowledge of the game to help me get my fix. It’s not exactly Chippewa Falls recreational league softball at Casper Park, but it’ll have to do. The following blog is nothing but me whining about all the great baseball I’ve missed since coming to Thailand. You’ve been warned. Every year the Yankees or Red Sox aren’t in the World Series, all I ask for is a seven-game Fall Classic. I hate knowing when the Series is over, I won’t be able to watch live baseball for five months. I want something to think about and enjoy throughout the offseason. The last time the World Series reached seven games before I came to Thailand was 2002. In the following eight seasons, it only reached six games twice. The World Series had become without drama … and then I left the country. 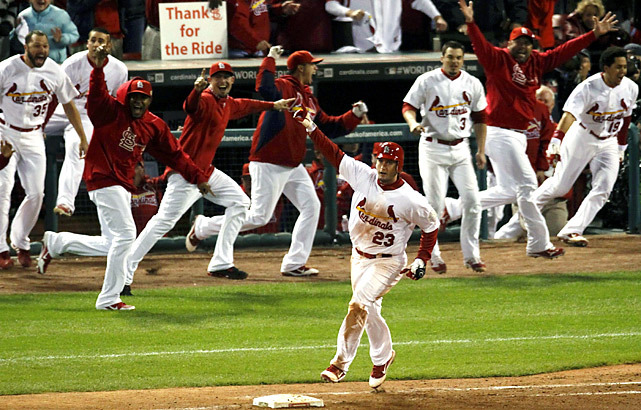 The 2011 World Series was insanely exciting, especially the sixth game (which I have on my computer and have watched many times over, especially the last three innings.) The best I could do was watch the play-by-play online at the office in the morning. With St. Louis runners on first and second, two out, two strikes on David Freese and a two run lead in the bottom of the ninth inning, it looked as though the Rangers would finally win their first championship after sixty years in the league. One triple later, the game was tied. Unbelievable. I watched this drama unfold via online play-by-play on my computer on a weekday morning. After a two-run home run by Josh Hamilton in the top of the 10th, the Cardinals had runners on first and second again with Lance Berkman at the plate, down one run with two out and two strikes, it looked again as if Texas would finally get that title. A single to center sent the runner home to tie the game again. Unbelievable. Damn you if you think I’m gone at the right time as my team, the Twins, are playing poorly. I don’t care! In fact, sometimes I prefer it as then I can get better tickets and am not surrounded by fair-weather fans who don’t understand that the close call on the attempted stolen base doesn’t matter because the batter just walked, forcing the runner to second. They can’t all play like they did in ’91. Joe Mauer is being Joe Mauer again, Josh Willingham is blasting home runs at a pace rarely seen in my life, Scott Diamond is showing tremendous promise, Ben Revere has finally arrived and is stealing bases like no Twin since Chuck Knoblauch, Denard Span is making Puckett and Torii Hunter proud with his center field skills, and the novelty of Target Field is finally wearing off. It’s a great time to be a Twins fan and I miss those last-place bastards. I don’t care! 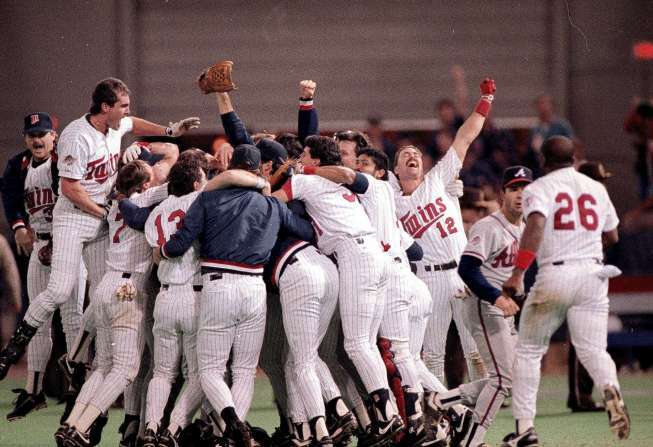 One of my favorite teams was the 1996 Minnesota Twins who finished the season with a 77-85 record: Greg Myers, Scott Stahoviak, Chuck Knoblauch, Pat Meares, Dave Hollins, Matt Lawton, Rich Becker, Marty Cordova and Paul Molitor made up the starting lineup (yes, I did that from memory). The Pirates are my National League team. As long as they’re not playing the Twins in interleague games (Pittsburgh took two of three from us this year), I’m rooting for them. They haven’t had a winning season since a skinny Barry Bonds played for them in 1992. They’ve endured the longest season losing streak in professional sports history and that’s all going to end this year. Not only is it going to end (with 33 games remaining, they only need to win 13 of them), but they’ll also be playing meaningful baseball in September and might even fight their way to a wild-card playoff spot. 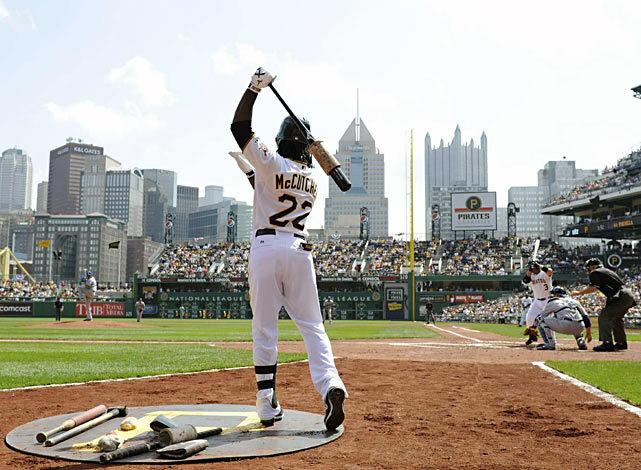 THE man in Pittsburgh right now, Andrew McCutchen. Erin is from Pittsburgh and doesn’t share my optimism and I can’t blame her as I’m sure watching the Pirates from within the city has been heartbreaking. They’re like a Liz Taylor marriage – despite the smile on wedding day (Opening Day), no one can see it working out. I haven’t checked the American Association standings and I don’t care that much. 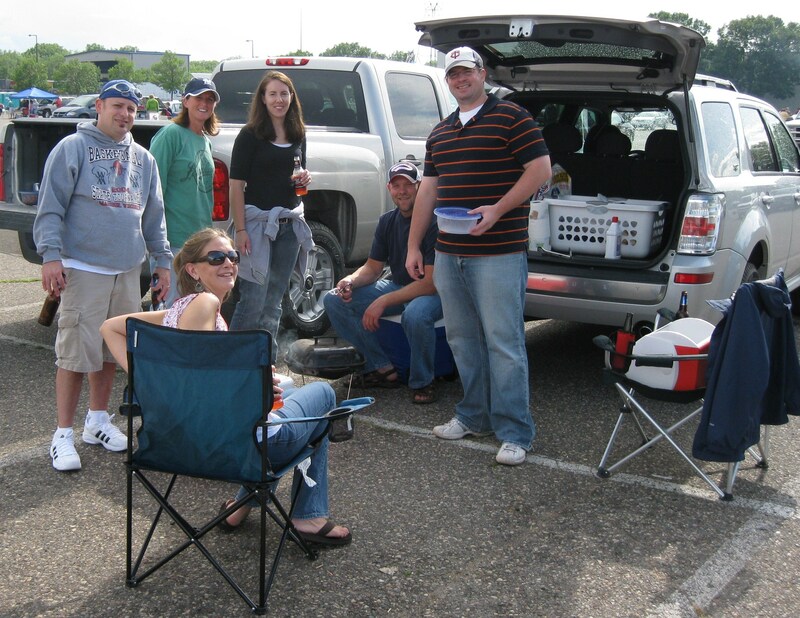 It’s not about wins and losses with the Saints, but the fun to be had at the ballpark. Thailand is filled with baseball weather – even poor baseball weather. Weather that’s hot and sticky and uncomfortable, but bearable if I’m watching a Saints game in the shade with a bratwurst in one hand and a cold Summit Extra Pale Ale in the other. This is what Saints baseball is all about. How I miss frustrating my opponents in the Chippewa Falls recreation league by slapping grounders to the third baseman and either beating out the throw to first or forcing an error, allowing the runner on second to find his way to third. I also miss having a beer or two after the game with the guys as we watch the next game begin and then making our way to Sweeney’s Bar and Grill for pizza, peanuts and beer while discussing our game as well as the condition of the Twins and Brewers while watching ESPN highlights on the screens above the bartender earning big tips with her smile and tight t-shirt. It’s been years since I had cable allowing me to watch baseball every night of the summer. I instead to save my money and occasionally watch the games a local pubs, my favorite being Mogie’s on Water Street in Eau Claire. Mogie’s has the best burgers I’ve ever had as well as delicious onion rings and plenty of beers on tap, a few of them changing with the season. I’ve never had a qualms about riding my Trek from my place on Farwell down the bike trail and locking it up across the street next to the river and going inside on a weekday evening for a Garcia burger (seasoned beef and sour cream, guacamole and salsa on a quality bun), onion rings, three or four glasses of beer (Grain Belt, Summit, Guinness or whatever is in season) and a combination of the Brewers and Twins game as well as whatever ESPN or MLB Network is showing that night. On a good night when football has yet to begin, there could be three games going on three TVs. On an even better night, all these options are available and I also just got a new issue of Rolling Stone with Bob Dylan on the cover. 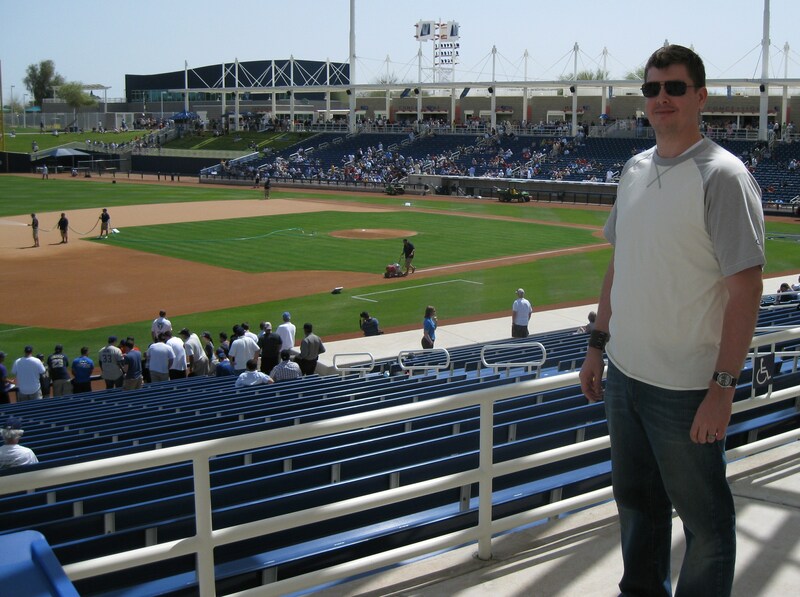 My buddy Lee at the Brewers spring training game outside of Phoenix. I’m going to do my best to catch a few playoff games when I’m in Chiang Mai in October, but I’m not counting on it. My absence from the game is only going to increase my love for it. In response to my friend Dan’s blog about baseball, I will conclude with my own lifetime team. Starting rotation: Frank Viola (1988), Johan Santana (2004), Bert Blyleven (1987), Les Straker (1987) and Francisco Liriano (2006). Bullpen: Joe Nathan (2006), Rick Aguilera (1991), Eddie Guardado (2002), Keith Atherton (1987, mostly for the tinted glasses) and Carl Willis (1991). 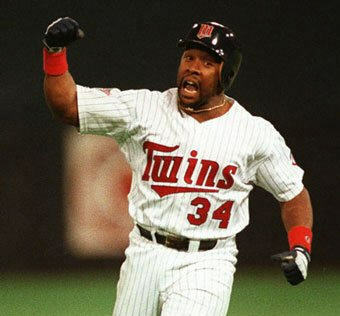 Touch ’em all, Kirby Puckett! 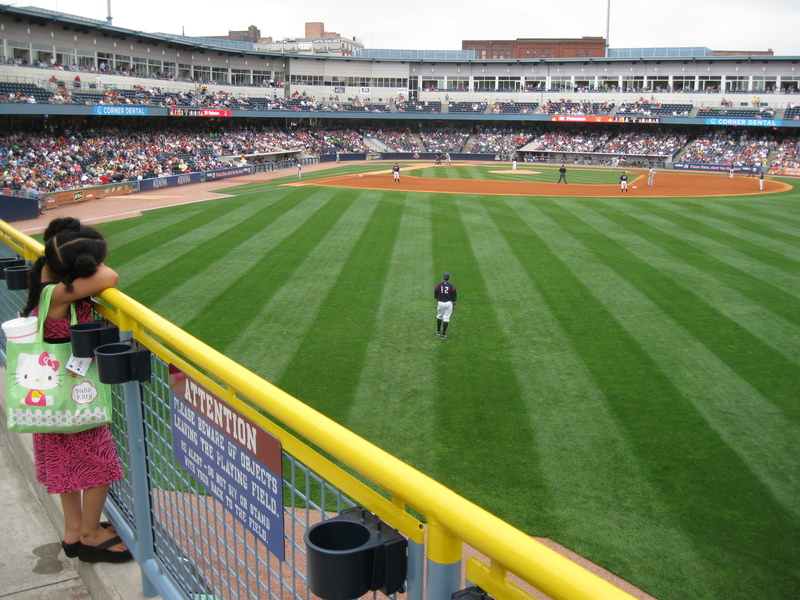 Home of the Toledo Mudhens. Nolan Ryan, Dwight Gooden, Jim Abbott, Eric Davis, Dave Winfield, Bo Jackson, Frank Thomas, Ichiro, Pete Rose, Reggie Jackson (mainly for his role in The Naked Gun), Barry Bonds, Ken Griffey Jr., Paul Molitor. 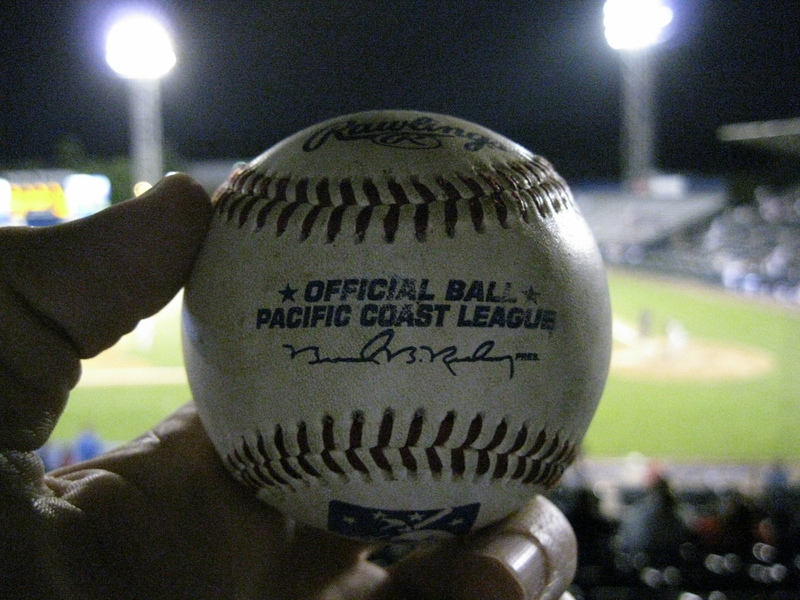 This entry was posted in Peace Corps and tagged baseball, minnesota twins, peace corps, pittsburgh pirates, sports, st. paul saints, thailand by Jeff Jackson. Bookmark the permalink.